Via Trading is active in the Greater Los Angeles community participating in local events, donating to local charities and partnering with community organizations. Please review some our Community Outreach activities below. For donations to a local organization or to invite Via Trading to participate in a Los Angeles event, please email sales@viatrading.com. Beneficiaries must be recognized in the State of California as a 501(C)(3) non-profit organization and be able to provide paperwork to that effect. Women of Watts and beyond is most noted for its annual Marches. 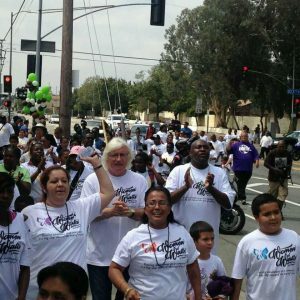 Every year, WOW hosts a “Stop The Violence March” in the streets of Watts. We are dedicated to serving the Watts community and continues to hope for its progression toward positive behavior and attitude within the people who reside there. Organizing the annual “Stop The Violence March” and other events in our community is a year-round effort. We appreciate all the volunteers, partners and sponsors who assist us year after year. We thank Via Trading for providing toys to give along the route in our 2018 event. The kids were happy to line up to pick out their new toys. 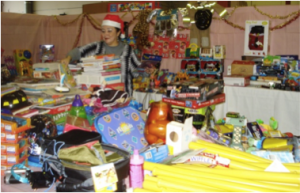 Thank you sincerely for Via Trading’s Toy donation for Mexico Mission Trip that happened in Uruapan, Mexico. (June 25-30, 2018) Your donation of 2 pallets of toys were distributed to over 150 kids who lived in a very poor condition but it brought joy to their life. We picked up the toy from Via Trading. However, we had to take the toys out of their original packaging otherwise the Mexico border patrol may confiscate thinking that we are going to sell it. We distributed the toys which brought the biggest smiles to their faces. Thank you Via Trading! May God bless you and bless Via Trading! 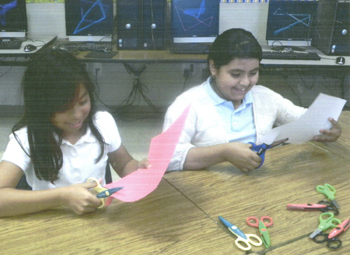 Project Hope serves 3,000 plus children in the Lane County school districts that have economic challenges. 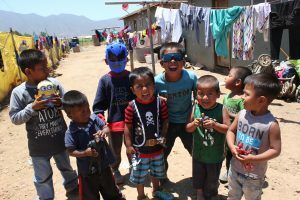 During Project Hope, the students receive new shoes and socks, backpacks will with supplies, haircuts, a medical clinic, ALL FREE, and set in a fun, kids’ fair environment with food and games. This year, 2018. Via Trading helped us by discounting two pallets of quality shoes by 25%. We were happy with them. We hope to increase that to 3 pallets by next year. Thanks for your partnership in serving kids in need. Hi Via Staff, Thank you for helping the City of Los Angeles and Old School New School foundation with your donation of a pallet of school supply folders and notebooks when we needed them the most and in such short time frame. Thanks to you and your company we were able to successfully give out supplies to over 50+ children in South LA of all different races, demographics, and needs at our Just Because We Care event at the Martin Luther King Recreation Center on October 6th. Thank you again and we hope you can continue to consider us as partners in future events to serve the community. One of our mandates and missions locally is to reach out to hurting people beyond the four walls of the church and to provide a dignified ministry to the poor. 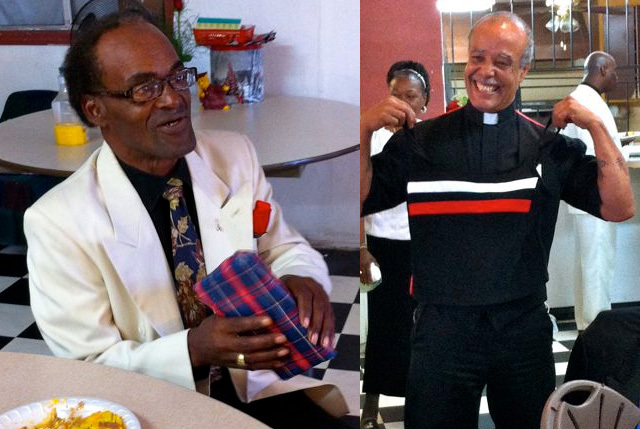 Individuals from the streets, shelters and missions throughout the greater Los Angeles and South Bay areas are transported bus to The Place of Grace for a time of ministry that includes fee clothing, food personal hygiene items and a healthy sack lunch. The Force of Hope-Economic Development Corporation, a division of Clarence E. McClendon Ministries wishes to thank you for supporting our Thanksgiving Community Outreach Event on Thursday, November 24, 2016. Via Trading donated a couple hundred toys to Victory Outreach for their event in December. The toys were then given away to children around Huntington Park – many coming from families with limited resources. On Sunday May 8tb 2016, Via Trading participated in a Foster Care Counts hosted Mother’s Day Event. Foster Care Counts is comprised of concerned volunteers who believe foster youth deserve more attention and support from our community than they have received. We provide funding and volunteer talent to established foster care organizations. 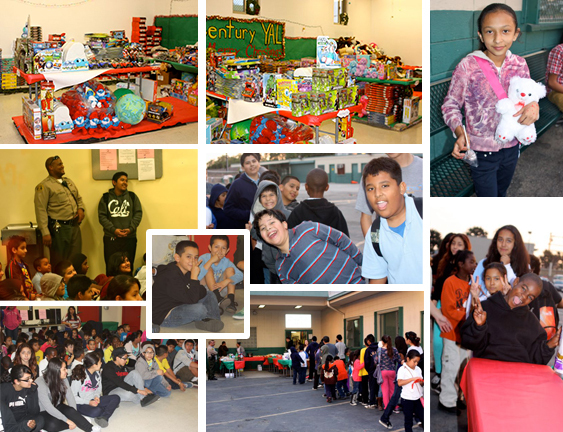 Via Trading had the privilege of participating in the Century Station’s chapter of the Los Angeles Youth Foundation‘s Christmas celebration. The Los Angeles youth Foundation is made up of 17 Youth Activities Leagues in Los Angeles County that are committed to mentoring youth and promoting a positive relationship between law enforcement and the community. Via Trading had the pleasure of supplying some of the giveaways for Century Station’s YAL Christmas party and enjoying an afternoon of laughter and celebration with the 65 children who frequent that location. 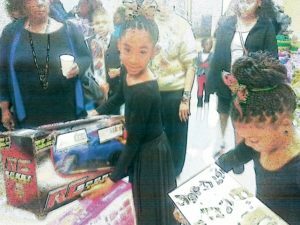 The kids gathered at the YAL after school, performed a play, sang Christmas carols, ate a Christmas dinner and each received three toys to take home. 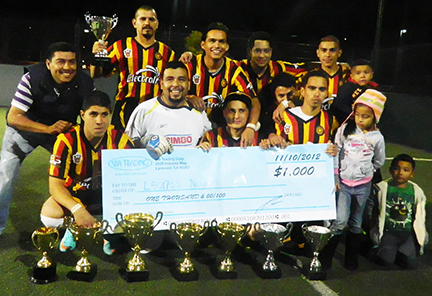 Via Trading partnered with Goals Soccer Centers in sponsorship of their local annual Goals Soccer Championship. Goals Soccer’s mission is to provide state-of-the-art turf fields and world class facilities to youth and adult soccer teams in and around the Los Angeles area. 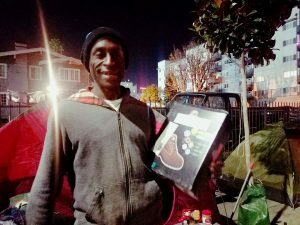 Via Trading partnered with the Force of Hope/Bishop Clarence E. McClendon Ministries to bring over 200 pairs of shoes to the homeless population of Skid Row in Los Angeles. Volunteers reunited at the Union Rescue Mission in LA, and welcomed hundreds of homeless individuals for a warm meal and a free pair of shoes. The McClendon Ministries spoke to the Union Rescue Mission about the needs of hundreds of people living on the streets of downtown Los Angeles. 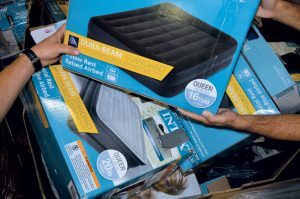 Hundreds of people convened underneath tents mounted specially for the event, and men, women and children were handed a pair of new Avia athletic shoes. 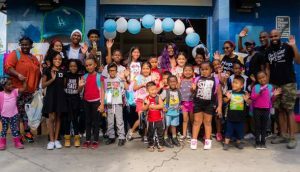 Via Trading had the honor of partnering with The Shoe Crew in their efforts to collect and donate much needed new athletic shoes to underprivileged kids in the greater Los Angeles area. 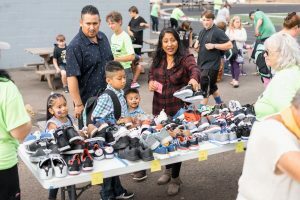 The Shoe Crew’s mission is to provide underprivileged youth with shoes at the end of the summer so they can begin the school year on a good note. 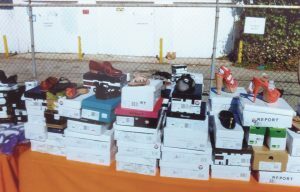 “All kids deserve to have comfortable, nice-looking shoes for school,” said volunteer Gabriel Welch. The Shoe Crew collected 1,804 pairs of shoes and is getting close to reaching their goal just in time for the Back to School season. The crew collected enough shoes to provide ALL the kids at A Place Called Home with new shoes, and are hoping to collect a few hundred more pairs of shoes to fill the warehouse at Shoes That Fit. On Sunday, May 13th 2012, Via Trading had the honor of attending the LA Community Outreach Center’s Mother’s Day Lunch, put together by the shelter’s volunteer director, residents and fellow volunteers. The long hallway to the community’s communal area echoed with the laughter of young and old residents alike. We walked right into a white elephant gift-giving ceremony that had each resident choose an unknown gift out of a basket when his or her name was called. We were welcomed with hugs and ample thanks for the donation of cleaning supplies we had made to this heart-warming organization earlier in the week. Via Trading had the honor of participating in a community event in our local area of Watts, to bring a hot meal and toys to the disadvantaged families of the area before the holidays. 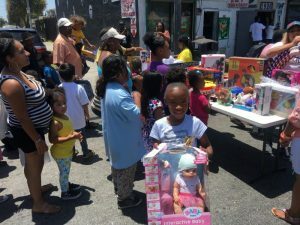 The event was held at the Watts Labor Community Action Committee (WLCAC) center, a non-profit, community-based, human social services organization dedicated to improving the quality of life of South Central LA residents. 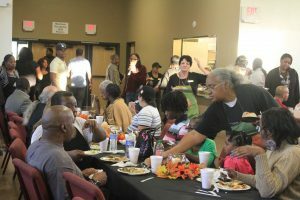 Families were invited into the auditorium, where they were served a hot meal that they enjoyed at picnic tables inside and outside the auditorium. Children played as parents finished their meals. Hundreds of families lined up outside the WLCAC’s facilities awaiting their pre-holiday meal and festivities. Walden House always works to “Give Hope, Change Lives,” but it is at Christmas time that we work to transform two Walden House locations from warehouses to Winter Wonderlands. We here at Walden House set up a sort of West Coast outpost for Santa, filled with games, puzzles, books, clothing and other items so each Walden House member can pick out outfits and gifts for his or her family – ensuring that everyone will have something special for the holidays. 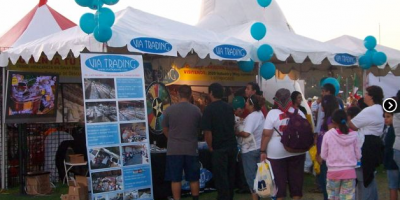 In September of 2008, Via Trading participated in the El Grito event in Huntington Park, California along with hundreds of other companies and thousands of individuals to celebrate the Mexican Independence Day. We welcomed hundreds of people to our booth and educated them on how they could start their own business and achieve financial independence with a minimal investment.